Donegal Gaeltacht community spirit rises: but where’s the money? 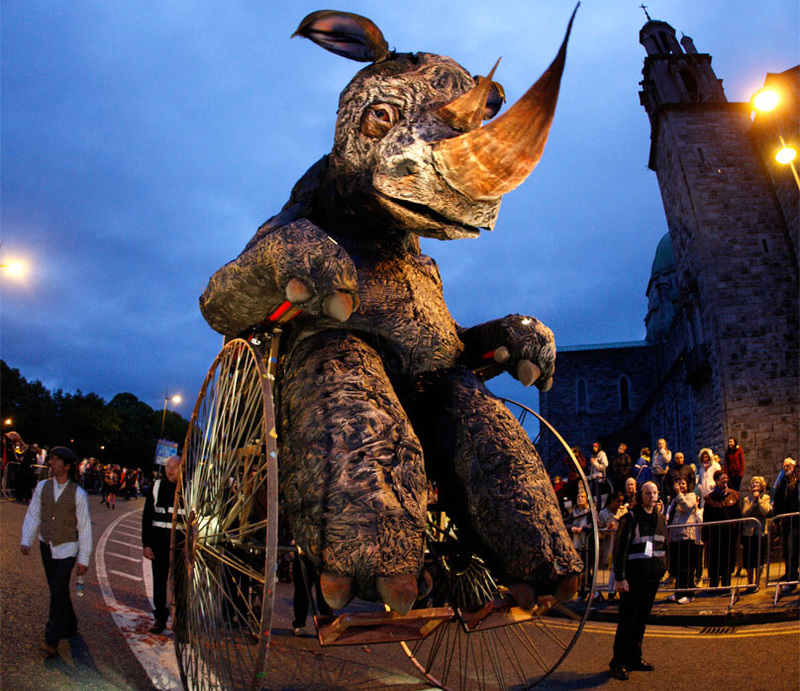 Some years ago, displaying immense creativity and skill, a local team of hard-working people in Galway created ‘Macnas,’ an organisation that produces a series of exciting, colourful outdoor parades and indoor shows filled with magnificent costumes and performers. With generous funding from the Arts Council, Údarás na Gaeltachta, Culture Ireland and Galway Council, the company expanded rapidly; exciting and inspiring audiences worldwide with performances as diverse as U2’s Zooropa Tour; the Millennium parade in New York City; WOMADelaide, South Australia; Chaoyang Spring Carnival, Beijing; the President’s Garden Party, Áras an Uachtaráin; and in a host of festivals, towns and cities throughout Ireland and across Europe. 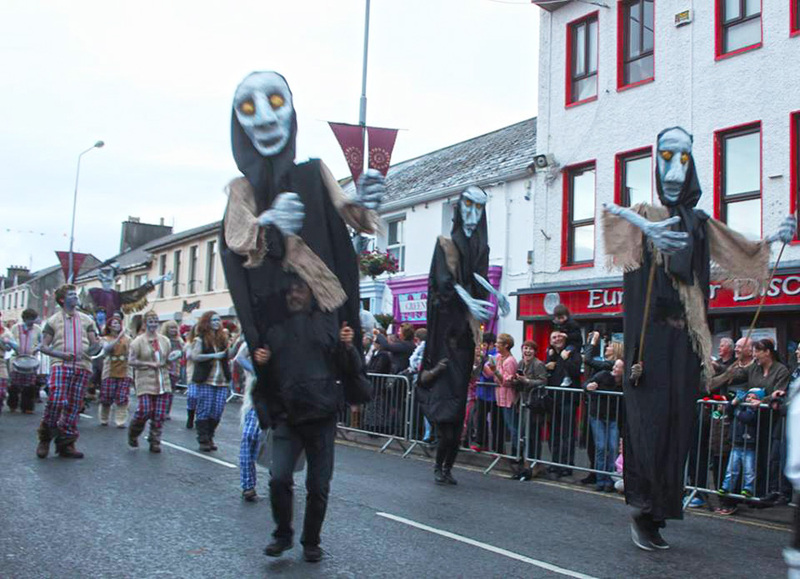 This weekend in the west Donegal town of Falcarragh, a similar group of local hard-working people, under the leadership of festival director, Kathleen Gallagher, and Sean Fitzgerald, will recreate a similar dazzlingly entertaining costume and culture filled show entitled ‘Evil Eye’ (Féile na Súile Nimhe). Featuring large-scale puppet characters, a samba band with Formorian soldiers (ancient sea-farers) and stilt walkers, it will highlight unforgettable Celtic legendary characters such as Balor of the Evil Eye and Lugh, the Sun God (thus ‘Lugh’s Mountain’ now known as Errigal) and the history of the Cloch Cheann Fhaola area. ‘Evil Eye’ Festival Falcarragh, Donegal – organised on a budget of around 4,000 euro. 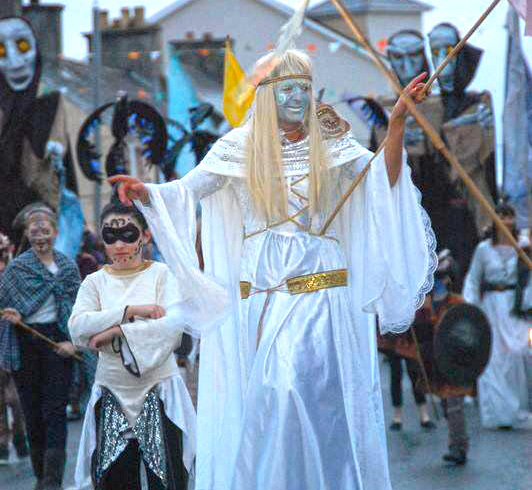 A whopping ten times less than Galway’s Macnas (photo courtesy Eddie McFadden). But there’s one major difference between the two festivals: while the Galway team hosts its show with pockets bulging with euro (an estimated 40,000 euro per festival, according to national news reports) – the Falcarragh one has a few pennies. And most of that was raised through its own activities, including determined people who tackled their first adventure race – the 23-kilometer combined run, kayak and cycling Mulroy Bay competition– and, later, the even more challenging 44-kilometer ‘Gael Force’ race. So how does Údarás na Gaeltachta, the Arts Council and Donegal County Council view this admirable cultural tourism project? Representatives of the above organisations came to enjoy the Falcarragh festival last year, full of praise for the creators of the extravaganza, a highlight in the west Donegal social calendar. But when asked for money, they all suddenly shied away. 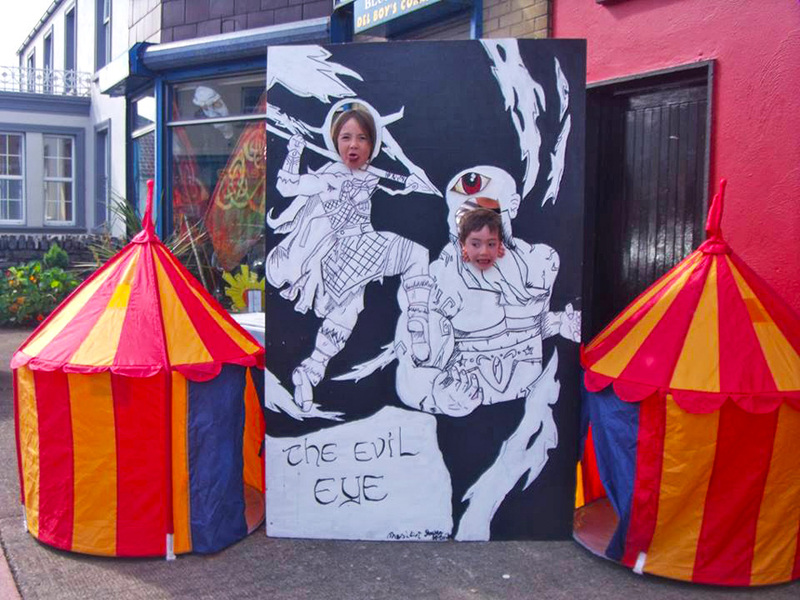 While more than 500,000 euro has been given to Macnas in Galway, the Arts Council finally granted a paltry 600 euro for ‘Evil Eye’ and around 1,250 euro is supposed to be donated from the council’s ‘The Gathering’ fund (money not received as of blog posting – two day before event begins). In its turn, Údarás Donegal contacted the organisers earlier this year, but not to offer financial support. Instead, it called only to inform the team that the application deadline had passed (would it not have been more constructive to have contacted them before, not after, the deadline, especially has it had moved the date forward?). Later, when approached for some space in one of its industrial estates in which to construct the festival’s giant puppets and store equipment and costumes, Udaras demanded 50 per cent of the commercial rate, which obviously – on such a tiny budget – the community group could not afford. Ironically, Údarás has thousands of square meters of space lying empty and unused in its industrial estates throughout the Gaeltacht for which it is already paying utilities, spaces that are supposed to be used for ‘community development.’ In the end, it was the generosity of local Falcarragh man, John ‘the Rake’ McFadden, that helped save the annual ‘Evil Eye’ festival. He donated his large agricultural shed to organisers. ‘Evil Eye’ festival combines entertainment with education on Celtic history for both adults and children. Faced with a severe lack of funding assistance, the hardworking festival team were forced to borrow and beg – costumes from the Northwest Carnival Initiative in Derry for 30 members of the Cloughaneely Marching Band who will act as seahorses in the historical re-enactment and other costumes from the Inishowen Carnival Group for 12 volunteer samba dancers. They also had to rely on the efforts of organisers of a childrens’ summer camp in Ballina Resource Centre at which local kids made shields and swords, 10 of whom will march in the festival. Nine members of the Curragh Club of Magheraroarty, as well as local plasterers, who will walk on stilts, are also helping out. If this kind of creativity and community spirit had been displayed in other countries such as the US or Australia, it would probably be recognized immediately as such and funding made readily available (as indeed it is in other Irish counties such as Galway). Yet Údarás in Donegal, with Fine Gael national board member, John Curran, living nearby, continue to ignore such culture tourism projects, projects with the potential for economic development through tourism, while at the same time wasting public money on generous expenses and junkets for its staff members (including a large delegation who traveled, with their spouses, on an all-expenses paid trip to Las Vegas – to meet officials of Dublin-based Enterprise Ireland). Údarás Donegal refused to give ‘Evil Eye’ organisers free space in its empty industrial estates for the construction and storage of giant puppets. It’s a shame the Arts Council, Donegal County Council and Údarás na Gaeltachta don’t seem to agree. While misguided policies, cronyism and wastage of public money has been an unfortunate hallmark of Údarás almost since its inception, the good news in this instance is that due to the sterling efforts of Falcarragh volunteers, the ‘Evil Eye’ festival is going ahead. So why not treat yourself, family and friends to a wonderful spectacle of colour, culture and heritage and pop along to Falcarragh between August 22nd and 24th. A festival highlight will be a medieval banquet in St Ann’s Church Killult, the 1900’s structure providing an excellent setting for a magical evening of song, dance and drama. The festival will also pay tribute to the history of Muckish Mountain’s mining legacy with guided walks on the old Miners Path and disused railway tracks. It will also feature birds of prey and weaponry displays, complete with a pig on a spit in a ‘medieval field’ while skills of strength and agility will be tested in a range of quest games to find one of the story’s main characters, Lugh Lámhfhada. For further information, see Evil Eye Festival site. This entry was posted in Donegal and tagged Arts Council, Balor, Celtic, Chaoyang Spring Carnival, Cloughaneely Marching Band, community, council, culture, Culture Ireland, Derry, Donegal, Donegal County Council, Errigal, evil eye, Falcarragh, festival, Formorian, Gael Force, Galway, Galway Council, Gearoid O’Smaolain, Inishowen, Inishowen Carnival Group, Ireland, John Curran, John McFadden, Kathleen Gallagher, Lugh, Macnas, Mulroy Bay, Northwest Carnival Initiative, Sean Fitzgerald, the Evil Eye, Udaras na Gaeltachta. Bookmark the permalink.